Follows the MVC code standards. The generated code is well structured and fits for version 1.6.x, 1.7.x, 2.5.x and 3.x. Comes in a free version. Save and build unlimited components. One month full featured subscription costs only 2.95 usd. Main FeaturesSome of the main features of the Joomla Component Generator. Search engine friendly URLs in both the Joomla Component Generator and the generated components. Choose between many different field types like, text, foreign key, radio, calendar, image, dropdown etc. With IntelliType the Component Generator will help you fill in fields. This means that information about views, tables etc. will be entered quicker. Restore all the default Joomla fields required for standard views in Joomla at the click of a button. 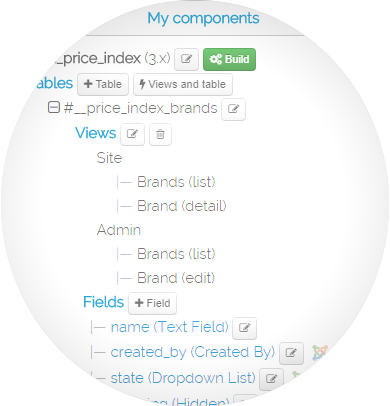 Drag drop reorder components, views, tables and fields in the generator. Drag drop reordering is available in all the views of the generated components as well. Store components for different versions of Joomla. Load stored components to continue work. 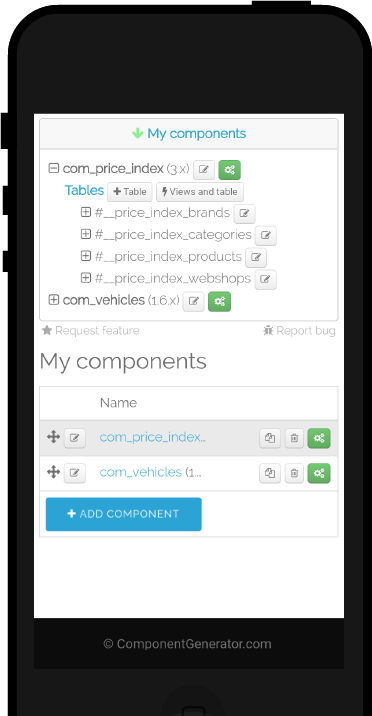 Duplicate entire components, views, tables or fields to reuse functionality and save time. The Component Generator automatically generates the code for your custom component and compresses everything into a ZIP archive ready to install into the Joomla CMS. Mobile ReadyThe Joomla Component Generator has a perfectly optimized responsive layout that adapts to your device. The Joomla Component Generator comes with a flexible and expandible navigation menu. This menu allows you to navigate with ease to handle tables, views and fields for your components. Furthermore it gives you a good overview of all your components. The navigation menu is available to both users with and without a subscription. 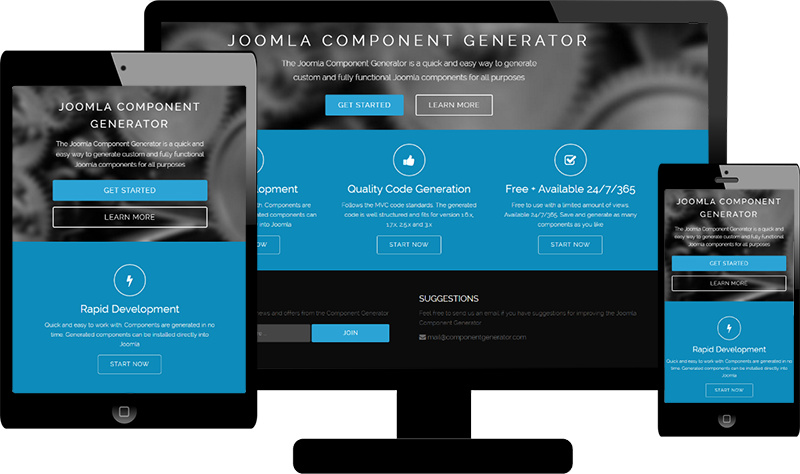 The Joomla Component Generator has a perfectly optimized responsive layout that adapts to your device. This means you will be able to access the generator from mobile phones, tablets or desktop devices at any time anywhere.